First of all: "Eid Mubarak" to all my Muslim friends and blog-readers! Tonight is the end of Ramadan; the most important month on the yearly Islamic calendar, lasting 29 to 30 days. It is a month in which participating Muslims refrain from eating, drinking and smoking during the day-light hours. It is also a time for spiritual reflection and worship. Unlike popular believe, Ramadan does not really effect non-Muslims too much living in Dubai. Needless to say, one pays respect to fasting Muslims by not eating and drinking in public places during the day. Beside this, most companies are working Ramadan timings, finishing work a few hours earlier than usual. Eid-Al-Fitr ( Arabic for "Festivity of the breaking of the fast" ), which starts today, marks the end of Ramadan and depending on the work sector gives one, 1 to 3 days of holiday. It is announced as the moon is spotted the day after new moon. 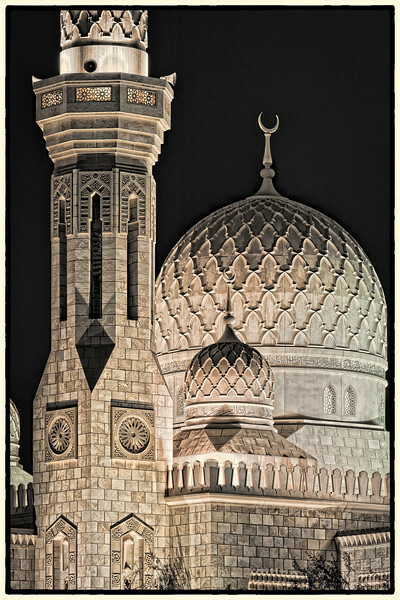 More of my Mosque images can be found here. Old train stations make for great photography subjects... One of them is the "Gare de Nice ville" at the French Cote d'Azur, which was completed in 1867 and has remained pretty much in it original condition. I passed through the station on my way to the worlds second smallest country (1.98 sqkm), Monaco. Some of the images of Monaco, the most densely populated country in the world, can be found here. The steel rusty pillars make for an interesting HDR (High Dynamic Range) subject. I've now been asked multiple times what my preferred HDR software is. To be honest I also have a hard time choosing between my two favorites; Photomatix 4 and Nik Software HDR Efex Pro. I personally feel like both of them have a place in my HDR workflow. Sometimes I just try both and go with the best result! If interested in HDR photography make sure you check out the latest book by Rafael Concepcion, "The HDR book", a practical approach to the HDR workflow. Remember when photographing a subject, the first few pictures you take, the best ones you make! 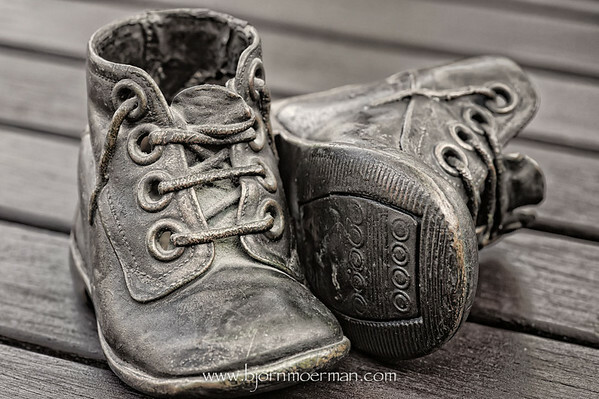 Pic(k) of the week 33: These shoes are made for walking! Before we go any further I need to praise my mum, who last year at the age of 64, picked up her first digital DSLR! Needless to say, she has a steep learning curve ahead, but she really seems to enjoy taking her Canon 500D out and has an interesting photographical eye. I guess I now know where I got the photo-bug from! Follow her on Facebook here. She was actually the one who photographed them first last month. These are apparently my second pair of shoes which have been bronzed later by common tradition. Some selective coloring was put back after the high contrast Black and White conversion. Thanks for visiting and to quote David DuChemin remember: Gear is good, Vision is better! While post-processing, I often listen to podcasts or music. The tittle of todays post was born while listening to an Adele song, "Set fire to the rain"! The first morning on location in the French Pyrenees, we drove our little Fiat 500 up a mountain track and discovered plenty of opportunities for macro photography. The early morning mist was slowly lifting and the whole place had a mystique feel to it! My favorite image of the mornings shoot is the one above. Black and white macro images are not that common, but I really like how the sun reflects in the hundreds of drops looking like beautiful human eyes. I guess there is only so much luck one can have while being out there... a clover 4 would have been nice, but wikepedia tells me there is only a 1 in 10 000 chance for that! One of the last subjects I photographed before the sun set fire to the leftover raindrops, was some fungi nestled deeply into a large tree trunk. Apologies for being a few days late with my Pic(k) of the week post... it has been a bit of a hectic week! Slowly finishing the image editing process after my latest visit to the French Pyrenees, I today have uploaded 11 new ones to the Pyrenees gallery. 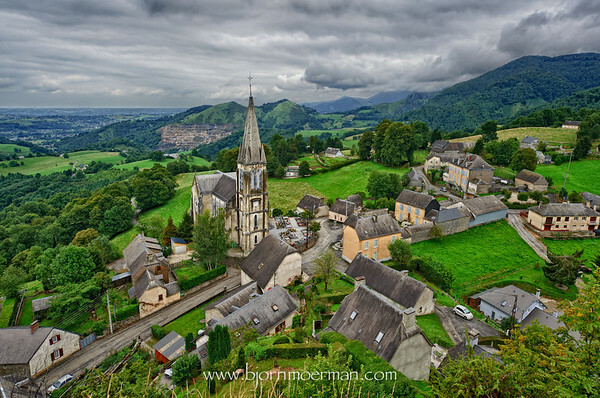 The image above of the small Hautes-Pyrenees village (less than 250 inhabitants) of Labassère has been made from a viewpoint near an old telegraph tower. The Gothic church dates back to the 14th century. Expect another post with more close-up and macro images in the next few days! Don't just take pictures, make pictures! Back from a 5 day break in the French Pyrenees and a few days in Belgium, the batteries are again fully charged! Even though the main purpose of the trip was to continue my Paragliding training, I also managed to do some photography. The weeklong escape from the Dubai Summer, started with a flight from Dubai to Paris on one of Emirates' Airbus A380 aircraft. Emirates has 90 (yes, ninety) Dubai double-decker busses on order. The 570 ton aircraft has been received very well by its passengers; be it due to the quietness of the cabin, the extra legroom, the business class bar or the first class showers. 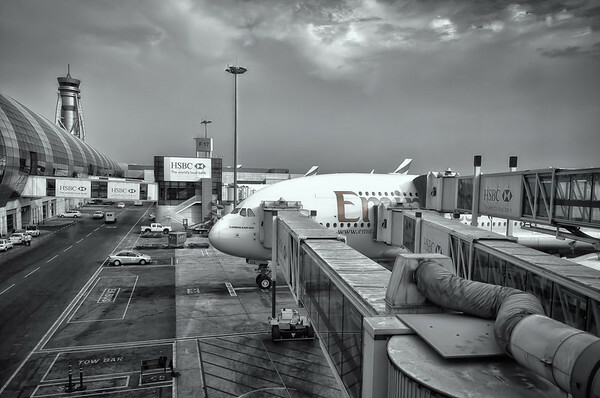 Just before boarding, I made a 5 shot HDR (High Dynamic Range) image (above) from one of the three jetways.